The present water crisis mandates the reuse of wastewater for non-potable purpose. In this study, raw kitchen wastewater (KWW) was treated using Eichhornia crassipes, as a low-cost and eco-friendly remediation method. The advantage of Eichhornia crassipes is quick and high efficiency for removal of pollutants from wastewater. It was found that during characterization of raw KWW, the value of pH and the concentration of nitrate nitrogen and ammonium nitrogen were exceeding the permissible limit for irrigation water quality. A field experiment was conducted for 21 days, and the physicochemical parameters were monitored at 3 days of interval. After treatment, the concentration of nitrate nitrogen and ammonium nitrogen reduced to 97.79% and 92.03%, respectively, within 15 days, whereas the pH value increased from 4.3 to 6.67. It was found that Eichhornia crassipes showed good reduction efficiency for BOD5 (77.23%), ammonium nitrogen (92.03%), total organic carbon (39.24%) and total suspended solids (95.94%) as compared to control (KWW sample without Eichhornia crassipes). An increase of 50% biomass of Eichhornia crassipes was observed at the end of the experiment. The study found that the treated KWW can be reused for irrigation purpose as it satisfied irrigation standard guidelines. Water is the most precious resource to prolong life on earth. Plessis  stated that out of the total available water resource, only 3% is freshwater, and approximately 69% of it is locked up in glaciers. Due to rapid urbanization, industrialization and growth in population, the availability of freshwater resource now become a critical issue. In future, the water demand for irrigation for a populated country like India will be 910 billion cubic metres (BCM) by 2025 and rise to 1072 BCM by 2050 . Thus, it is the high time to think not only about the judicious use of existing water resource but also for the reuse of wastewater for non-potable purposes. Domestic wastewater generates from household activities are mainly of two types: grey water (excluding toilet wastewater) and blackwater (including toilet wastewater) . The grey water contributes 80% of total domestic wastewater, and 44% of grey water is produced from the kitchen outlet from an Indian household . Kitchen wastewater (KWW) is produced on an average of 12 L per person per day (LPD) in the residential area in India , rural school 4 LPD , and Indian cities (Delhi, Kolkata, Mumbai, Hyderabad, Ahmadabad, Kanpur and Madurai) 14.92 LPD . KWW has the potential to combat the water crisis for non-potable use. A suitable treatment method is required for the treatment of KWW. Different types of plants have been used across the globe for KWW treatment. Phragmites australis was used in a constructed wetland, which is made up of half brick, gravel and sand layers for KWW treatment. The author suggested that this is helpful in reducing organic matter present in KWW . Plant species like Phragmites australis, Phragmites karka and Ipomoea aquatica were used for KWW treatment in a constructed wetland made up of gravels. This treated grey water can be reused for gardening or toilet flushing . Vetiver grass (Chrysopogon zizanioides) was planted in a drum filled with soil for KWW treatment. The treated wastewater can be reused for domestic and irrigation purposes . Water lettuce (Pistia stratiotes) was planted on a constructed wetland made up of gravel, sand and humus layer. This wetland is helpful in reducing the concentration of an organic and inorganic constituent of wastewater. The treated effluent is suitable for non-drinking purposes like crop irrigation and keeping aquatic animals . Eichhornia crassipes (EC) was used for KWW treatment in a constructed wetland made up of gravel, sand and humus layer. Treated effluent can be used for non-drinking purposes like crop irrigations and fishing . The pores of the upper layer of the substrate will be clogged by tiny particles present in KWW. Therefore, proper maintenance is required at a certain interval of time. In our earlier study, EC was used for 8 days for treatment of KWW, but this is not focused on more retention period . The performance of EC was also evaluated for domestic wastewater collected from stabilized pond [14, 15, 16], raw sewage from municipal wastewater treatment plant [17, 18], synthetic medium and groundwater , sewage from the aerated lagoon , raw wastewater from fish farm , dye wastewater , oily river water , domestic wastewater , dairy wastewater  and river water . KWW is away from toilet contamination and has less concentration of heavy metals . But the presence of oil and grease, nutrients (nitrate, ammonia), trace elements in KWW plays a significant contribution to pollute water bodies [27, 28, 29]. Stagnant KWW become a place of breeding environment for insect pests and release ammonia . Proper low-cost treatment of KWW will contribute significantly towards the conservation of freshwater . According to Panda et al. from the available freshwater, 85% is used for irrigation purpose. The use of treated KWW in irrigation will be beneficial for reducing the present water stress. Sivarajah and Gnanavelrajah  grew leafy vegetables Ipomoea aquatica and Alternanthera sessilis (excellent sources of carotene, folate, niacin, iron, vitamin C and calcium) using KWW (except detergents wash water). Growing plants using KWW solve problems of wastewater disposal and water scarcity. Abegunrin et al. reported that the use of untreated KWW for the irrigation of cucumbers did not adversely affect the soil. Domestic wastewater applied for irrigation had no significant effects apart from slight changes in salt solubility and alkalinity on clay soil . The present research work investigates the effectiveness of EC in raw KWW without aeration, without substrate layer, and without dilution in bench-scale field experimental set-up. In this study, raw KWW samples were collected from the hostel of National Institute of Technology Rourkela, India (22.2525°N, 84.9046°E). The collected KWW samples looked whitish with an oily smell and enriched with tiny food particles. For field experimental set-up, three plastic containers, each of 30-litre capacity were considered. Two containers (EC1 and EC2) were kept with KWW sample with EC for the treatment. One container was filled with only KWW sample referred as a control to observe the natural degradation. EC1, EC2 and control were kept in an open environment for 21 days and monitored at 3 days of interval. Before starting of the field experiments, healthy EC plants were collected from nearby ponds and washed carefully using tap water to remove dead plant parts. After that, these plants were kept in tap water for acclimatization. The details of the plant’s characteristics used for the experiment are shown in Table 1. The number of green leaves per plant was made by the visual count, while the leaf surface area was estimated using Blanco and Folegatti equation . For the characterization of KWW, the physical and chemical parameters like pH, nitrate nitrogen, ammonium nitrogen, oil and grease, dissolved oxygen (DO), biochemical oxygen demand (BOD5), total organic carbon (TOC), total suspended solids (TSSs) and total dissolved solids (TDSs) were evaluated for both raw and treated KWW samples. The list of standard followed, methods and instruments used for KWW characterization are summarized in Table 2. The measurement of pH, DO, and ammonium nitrogen was performed using HQ40D HACH meter. The nutrient nitrate nitrogen and TOC were measured by DR/890:8039 and DR/890:10129 HACH, respectively. The mean value of pH was calculated by mathematical transformation to hydrogen ion concentration and averaged it and then reconverted to pH . The TDS and TSS were measured by the gravimetric method using Indian Standard IS: 3025 part 16  and IS: 3025 part 17 , respectively. The oil and grease were measured by partition gravimetric method following IS: 3025 part 39 . Similarly, BOD5 was measured by dilution technique following IS: 3025 part 44 . Each test was conducted three times to minimize errors. The initial characterization of raw KWW sample in control, EC1 and EC2 is shown in Table 3. The obtained results were compared with the National Indian Standard IS: 2490 Part I  and International standards Food and Agriculture Organization (FAO) . Further, the results of a field experiment were compared with related existing literature. The result obtained from the natural degradation of KWW (control) and phytoremediation using EC (EC1 and EC2) were compared through an analysis of variance (single-factor ANOVA) for a 95% confidence interval. 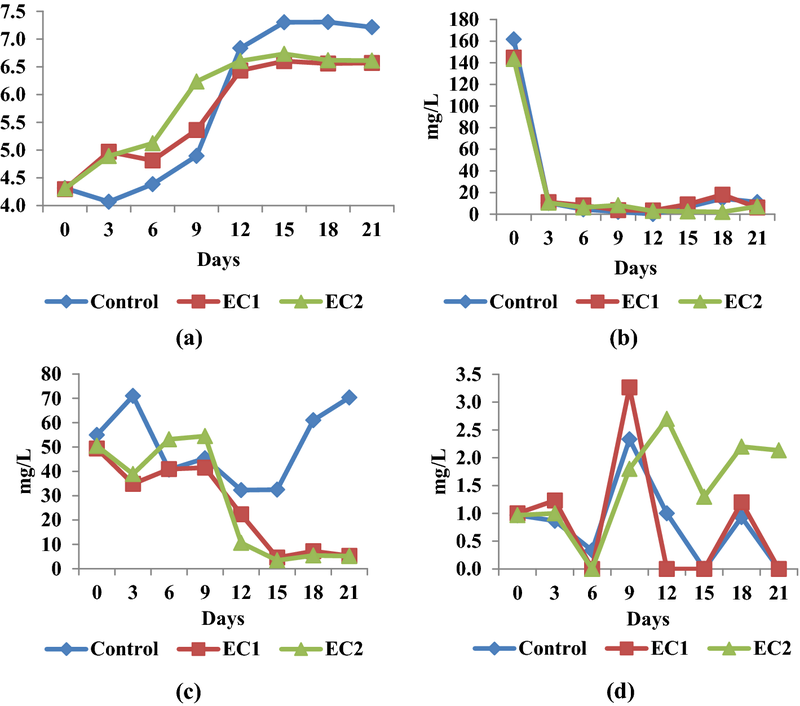 The study was carried out to evaluate the nutrient uptake capability of EC from raw KWW. This study also identified the effect of raw KWW on EC biomass. The field observation during 3 days of interval is mentioned in Table 4. Initially, the collected sample was whitish. After 12 days, the colour change was noticed in all the containers. Sample colour turned into blackish green in control due to the development of algae, whereas light brown colour was observed in EC1 and EC2 as the plant root started decaying. Dead plant leaves were manually separated from the plants. Similarly, the scum layer formed on wastewater surface and stuck on plant roots was manually removed. On day 9, new leaves were first observed in EC2 container. After completion of the experiment on day 21, larvae were detected in control. During field experiment, evaporation loss for control was approximately 0.68 L per day, whereas for EC1 and EC2 evapotranspiration loss was nearly 0.88 L per day and 0.90 L per day, respectively. The results obtained from ANOVA at alpha = 0.05 showed that there was a statistical significance to the result of ammonium nitrogen leading to reject the null hypothesis as F-value was higher than F critical, and the p value was less than alpha level. In Fig. 1, after day 9, it was observed that the pH value from 4.9 to 6.84 increased nonlinearly and formed an S-shaped curve for control, whereas the pH value for EC1 and EC2 increased linearly. Thus, EC has a gradual effect on pH increment. This may be due to the photosynthetic activity of EC. The dissolved CO2 present in KWW sample decreased during photosynthesis; as a result, pH value increased. Rezania et al. observed an increase in pH (13%) value during the treatment of domestic wastewater using EC. Akinbile and Yusoff  observed that by aeration, the pH reduction rate was higher in phytoremediation with EC. Gopal  found that for optimum growth condition of EC, pH should range within 6–8. For better microbial activities, the optimum pH values for the nitrification process may vary from 6.6 to 8.0 . A similar study was conducted by Seun et al. and observed an increase of 60.5% pH value during 10 days of the experiment. Different plants used for KWW treatment, in existing literature, are compared in Table 5. Fruit and vegetables like legumes, cauliflower, spinach, green peas, etc. are the sources of nitrogen, amino acid, and protein. Initially, organic nitrogen is converted to ammonia nitrogen by anaerobic process called ammonification, then ammonia nitrogen is converted to nitrate nitrogen by aerobic process called nitrification and finally, nitrate nitrogen is converted to nitrogen gas in a low-oxygen (anoxic) environment, and the process is known as denitrification . In control, nitrate nitrogen concentration reduced from 161.7 to 10.30 mg/L (93.63%) after 3 days. EC1 and EC2 showed almost the same percentage reduction (92%) after 3 days. Although control showed good response over EC, but EC did not add any nutrient to sample. Ayyasamy et al. found nitrate concentration reduced to 64% in a synthetic medium containing 100 mg/L of nitrate and observed that at higher concentration, reduction efficiency decreases due to osmotic pressure. 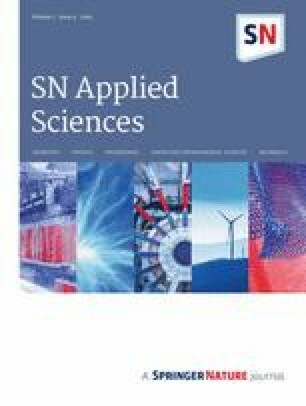 Seun et al. observed a reduction of 66.7% nitrate during 10 days of the experiment. As shown in Fig. 1, in control ammonium nitrogen concentration decreased from initial 54.93 to 32.30 mg/L (41.20%) in 12 days, and after that, it gradually increased. EC1 and EC2 showed ammonium nitrogen reduction efficiency of 90.81% and 93.24%, respectively, in 15 days. Parwin and Paul  observed good reduction efficiency (60.28%) in ammonium nitrogen while treating raw KWW using EC for 8 days. Rezania et al. found reduction efficiency of 95% for ammonium nitrogen, 92% for BOD5, 78% for chemical oxygen demand and 62% for TSS during treatment of domestic wastewater using EC. Ismail et al. reported that EC reduced the ammonium nitrogen concentration (72%) from domestic wastewater. It was observed that in 9 days, the DO of control and EC1 increased to 141.38% and 226.67%, respectively (Fig. 1). Akinbile and Yusoff  reported that for wastewater treated using EC with aeration, the value of DO increased to 36.55% within the first 3 weeks of the experiment. In a study conducted by Rezania et al. , 23% increase of DO level was observed in 14 days of experiment. Aerobic micro-organisms need oxygen for the degradation of organic matter present in raw KWW, thus reducing the oxygen concentration in the sample. Dense plant cover on water surface reduces atmospheric oxygen diffusion. The floating plants play a vital role in transferring atmospheric oxygen (30%–40%) to rhizosphere through aerenchyma (internal gas space) for aerobic microbial activity . BOD5 removal was recorded 62.28% for control, whereas 76.92% for EC1 and 77.55% for EC2 in 6 days (Fig. 2). Similarly, Costa et al. observed a reduction of 50% BOD5 in a hydraulic retention period of 20 days from piggery wastewater using EC. Kumari and Tripathi  reported that a mixed culture of EC and Salvinia natans was effective for removal of 84.5% of BOD5 and 26.6% of nitrate nitrogen in municipal wastewater. Plant root system acts as proper media for microbial growth providing an oxygenic condition in the rhizosphere for microbial degradation of organic pollutants [16, 46]. Similarly, Shah et al. indicated that the treatment performance of EC in 25% dye wastewater dilution was 42% for BOD5. In Fig. 2, TOC showed a good reduction of 38.81% for EC1 and 39.68% for EC2, whereas 35.31% for control in 21 days. In a study conducted by Parwin and Paul  after 8 days of the retention time, the removal efficiency of TOC was 15.38% and 13.67% for EC and control, respectively. Rezania et al. found a 45% reduction of TOC in 12 days of the experiment. TSS results showed significant reduction of 91.89% for control in 9 days, whereas EC1 and EC2 showed a 97.23% (in 12 days) and 94.51% (in 3 days), respectively (Fig. 2). Loan et al. indicated that treatment efficiency of EC was 53.3% for TSS, 53.4% for chemical oxygen demand, 61.4% for phosphate phosphorous and 32.6% for ammonium nitrogen after 21 days. Valipour et al. showed that the reduction efficiency of EC was 73.02% for TSS, 79% for chemical oxygen demand and 86.42% for BOD5 at a hydraulic retention time of 14 h. Kim et al. and Valipour et al. stated that while suspended solids try to pass through the plant roots, it can be trapped and become metabolized by micro-organisms as the roots of floating plants act as support for microbial growth, or it eventually settled due to the force of gravity. A higher value of TDS present in raw KWW may be due to the washing of plates and utensils that contain the food waste stuck into it. TDS removal for control (81.34%), EC1 (80.56%) and EC2 (72.20%) was observed in 21 days. A study by Munavalli and Saler  reported that EC had no significant effect on reducing TDS in dairy wastewater. As reported by Rezania et al. , 11% removal efficiency for TDS was found for treating domestic wastewater using EC. However, a reduction of 26% for TDS was reported by Moyo et al. during the treatment of polluted river water using EC. Similarly, Parwin and Paul  observed 67.72% and 69.97% reduction in TDS in control and EC, respectively. KWW especially from educational, professional organizations and restaurants is rich in oil and grease. Oil layer on the surface of water obstructs the evaporation loss but simultaneously prevents entry/exit of oxygen from the water surface. As per the observation, the oil reduction was almost the same in both control and EC. This is due to the formation of scum layer on the water surface of control and root zone and water surface of KWW treated with EC. During the experiment, the scum layer was manually removed from the surface and root zone for entry/exit of oxygen from the water surface. It is observed that the oil layer stuck on roots of plants prevents nutrient uptake from KWW. Hence, plant roots were washed with tap water at 3 days interval. Lopes and Piedade  observed that a lower dose of oil (< 3 mL/L) did not cause significant alteration in morphology and biomass of EC plants. During KWW treatment, the growth efficiency is based on increasing weight of biomass of EC from initial zero (0) day to last day (21st) of the experiment. It was observed that the growth in biomass obtained was 1185 g (51.92%) on day 21 for EC2, which is more in biomass when compared to EC1 (48.21%). A similar study was conducted by Rezania et al. , and Dixit et al. found an increase in biomass weight of 46% and 45%, respectively. The obtained results of control and EC were compared with IS: 2490 Part I  and FAO  in Table 6. The pH value for both control and EC was found to be suitable for irrigation use after 12 days of the experiment. According to the standard FAO  for both control and EC, the nitrate nitrogen concentration was suitable for irrigation use after 6 days. Treated KWW of EC1 and EC2 satisfied the ammonium nitrogen limit for irrigation after 15 days. There is no such standard limit for DO, BOD5, TSS, oil and grease and TOC in FAO . While comparing with TSS limit of irrigation standard IS: 2490 part 1 , on an average both control and EC were found to be suitable for irrigation use after day 9 and day 3, respectively. The initial TDS concentration was within the limit of IS: 2490 Part I  and FAO . The study aims to evaluate the pollutants’ removal efficiency of EC for raw KWW. Physicochemical parameters like pH, ammonium nitrogen, nitrate nitrogen, DO, BOD5, TOC, TSS, TDS, and oil and grease were monitored in 3 days of interval for 21 days of the experiment. KWW sample without EC was considered as control. Both EC and control were kept in the same environment for the same observation period. The reduction efficiency of EC showed significant results as compared to control for BOD5, ammonium nitrogen, TOC and TSS. However, the reduction in TDS and nitrate nitrogen was observed slightly more in control compared to EC. The treated KWW samples satisfied the irrigation standard of water quality. It is recommended for further heavy metal characterization of raw KWW. This study is a part of Ph.D. work. The authors would like to express their sincere gratitude and thanks to staff members of Environmental Engineering Laboratory of Civil Engineering Department of National Institute of Technology, Rourkela, for their help and assistance during laboratory analysis.